In a recent post, we asked why there hasn’t been a boom in housing construction in the Inland Empire. While this is not something that keeps most readers up at night, folks employed in the IE need somewhere to live, and housing development in the IE provides some form of a check on price increases in LA/OC. Thus, if housing prices in the IE are not kept low, prices in LA/OC are able to rise even further. Lastly, understanding the dynamics of housing construction in the IE might help shed light on region-wide issues in housing production. In the previous post, we looked at general trends in employment, housing starts, and wages in the LA/OC and IE. Here, we’ll look at a specific area that at first glance should be booming, but is seeing relatively little construction: Ontario Ranch. Ontario Ranch is the southeastern portion of the City of Ontario, one of the major commercial centers of San Bernardino County and an important hub in the booming trade and logistics industry. The lackluster growth in Ontario is not for want of zoning support or lot availability. 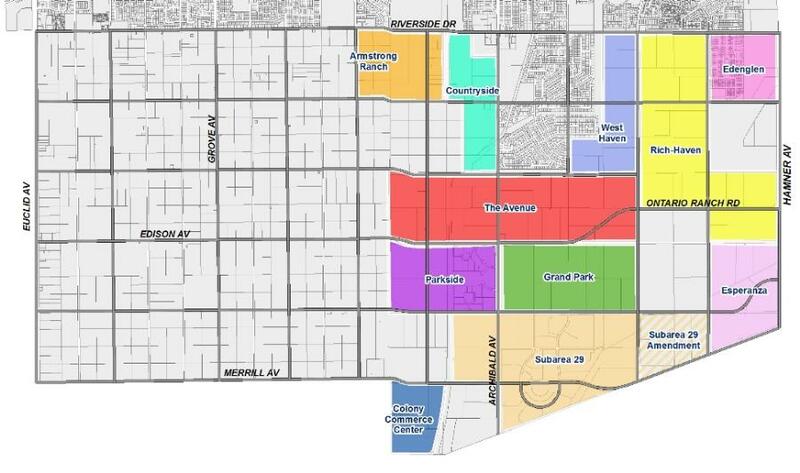 There are currently 9 approved specific plans in Ontario Ranch, with 2 more in process, for a total entitlement of almost 18,000 dwelling units (DUs). The map below shows the approved specific plans, and the following table shows the number of approved DUs. True to SoCal development patterns, the plans are thoroughly suburban, but still provide respectable densities. The 11 specific plans combined achieve an average density of 5.5 du/acre across an area just over 5 square miles. At Ontario’s current household size (3.64), this is about 12,700 people per square mile – not particularly dense by LA standards, but dense enough that a walkable suburban environment should be achievable. In addition, the city’s general plan provides several other areas zoned for mixed use and medium density (11-25 du/acre) residential. To the south, Ontario Ranch directly abuts the City of Eastvale, in Riverside County. Eastvale, a perennial favorite of noted anti-urbanist and NIMBY Joel Kotkin, grew from dairy farms to a city of 50,000 in just about a decade between 2000 and 2010. A quick perusal of record sales shows that some of the initial construction in Eastvale, in 2001, sold for around $210,000 to $225,000 and about $120/SF. This is about $280,000 to $300,000 or $160/SF in today’s dollars. 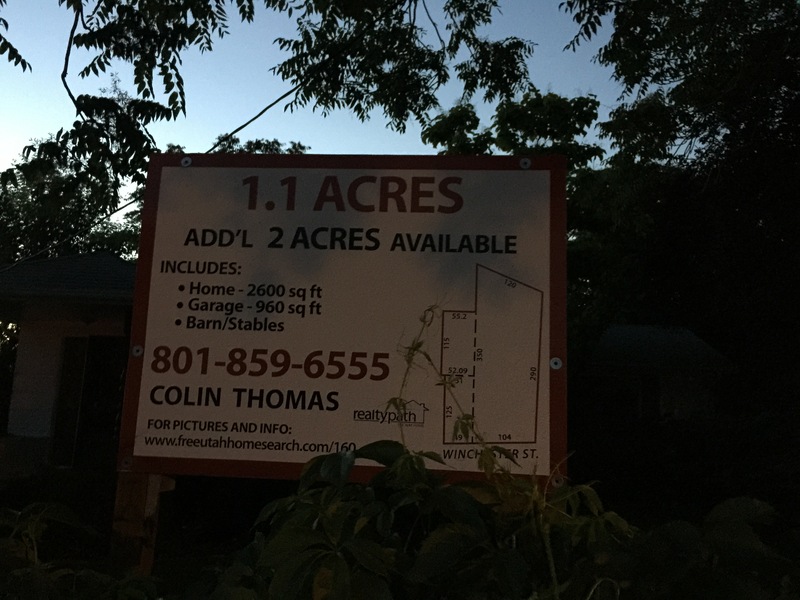 Equivalent new single-family construction is currently listed as starting around $385,000. Thus, real prices that are higher than those that induced the Eastvale boom in the early 2000s have failed to induce a boom in Ontario Ranch, directly adjacent. 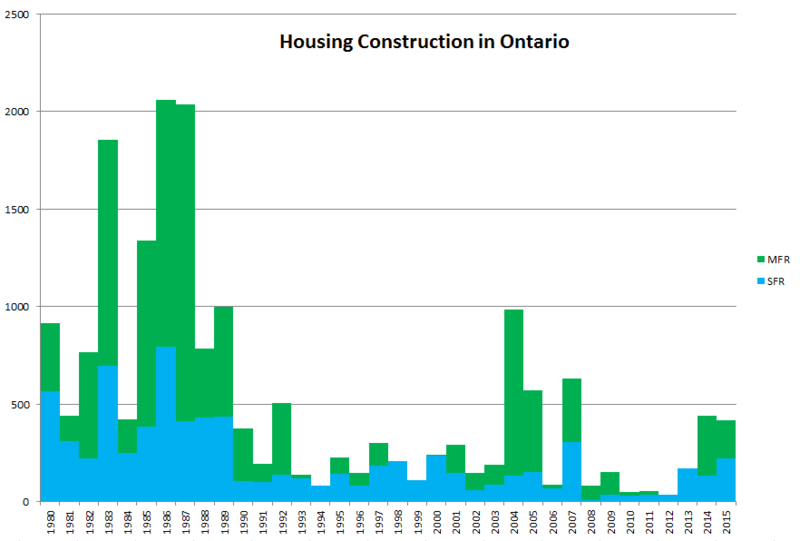 Here’s the number of housing units permitted in Ontario since 1980. In a perfectly competitive environment, assuming the cost of supplying houses has not changed appreciably, prices in Eastvale should not have rebounded to where they are. Ontario Ranch is slightly further from Orange County, but not enough to create such a steep price gradient. Once prices reached around $300,000, new construction in that price range should have been unleashed. Yet Ontario is on pace to permit less than 500 housing units this year, at which pace it will take over 3 decades to build out Ontario Ranch, over 3 times as long as it took to build a comparable amount of housing in Eastvale. What happened? As we mentioned in the previous post, builders have variously cited labor costs, materials costs, tight project financing, land costs, and tight mortgage standards as reasons for the lack of construction. The first three are beyond our ability to analyze here. 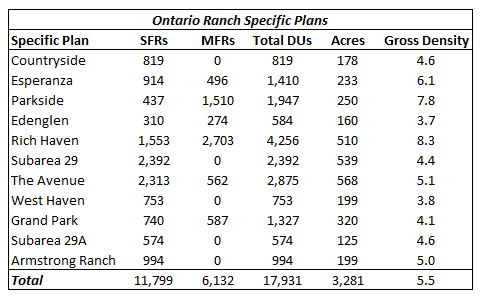 Land costs would not appear to be an issue in Ontario Ranch, where the developers responsible for the permitted master plans presumably already own the land. Tight mortgage standards are likely a factor; with stagnant wages, the 2000s boom was only possible thanks to outrageously bad lending. Another possibility, though this is speculation, is that there is an unwritten rule that new SFR construction can’t be allowed to cause a decrease in nominal prices. While prices have increased lately, in many places, they have not yet surpassed the bubble peak in nominal terms. Nothing will turn out the NIMBYs faster than the threat of declining property values. In such a case, construction will remain at low levels while nominal prices return to the bubble peak. With low inflation, this also results in a considerable increase in real prices. Whatever the reason, there doesn’t seem to be a housing boom on the horizon in the IE. For LA/OC, that means that unless we take action to align public policy with the goal of affordability, further increases in the cost of housing are probably in store. This entry was posted in Uncategorized and tagged Affordable housing, Inland Empire on November 28, 2015 by letsgola. In a previous post, I suggested that if you’re an urban- and transit-minded person visiting a city you don’t know much about, you should deliberately get off the beaten path in that city’s transit system. The idea is that doing touristy or business traveler-y stuff, you get a distorted idea of the city. You’ll learn more about LA transit riding the 720 or the 207 than you will trying to get from the airport to Union Station. Early this summer, I had a little free time in Salt Lake City. I didn’t have enough time to make it all the way to one of the ends of the lines (other than the airport, which doesn’t count), so I picked Fashion Place West. 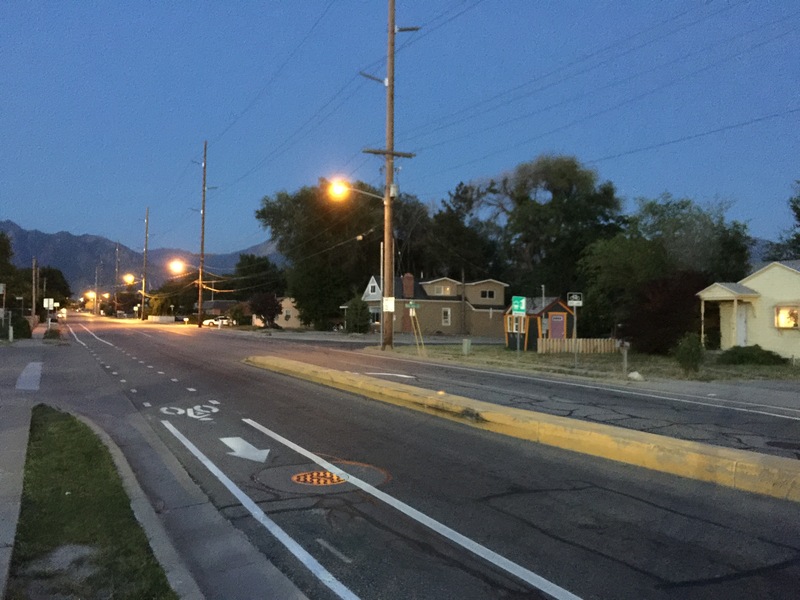 This station is about halfway out the lines south of Salt Lake City in Murray, where the Red Line and the Blue Line merge together. The UTA light rail system is heavily branching – three lines converge onto a single corridor – which can make providing frequent service to the ends quite difficult. This may not be a huge issue in a place like Salt Lake City, where a single central business district dominates. Anyway, off we go. Like many western US cities, Salt Lake City is blessed with amazing natural scenery that encourages you to enjoy the long view. 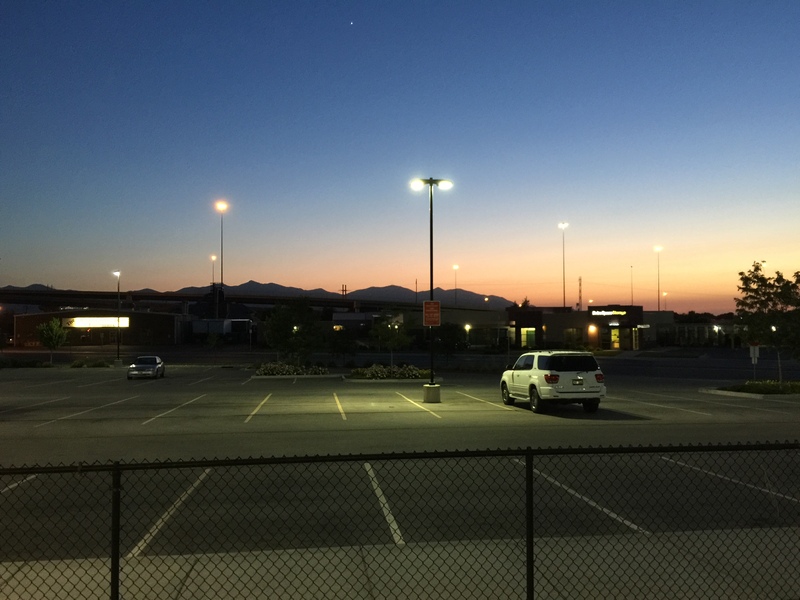 From the station, the dark mass of the Oquirrh Mountains rises above the interchange of the 15 and the 215 in soft twilight. 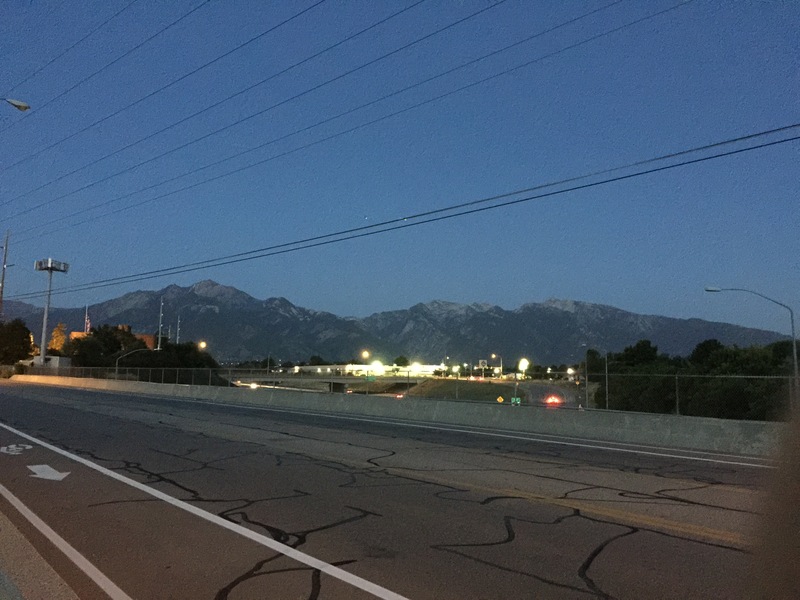 To the east, the much larger Wasatch Front rises in the distance down Winchester St, which leads to the Fashion Place mall, half a mile from the station. This street won’t win awards, but they do have bike lanes and decent sidewalks. Transit-adjacent barn. It’s not that the density tapers off quickly away from the station; there’s very little to begin with. Unfortunately, the route to the mall takes you across the 215. That view though. 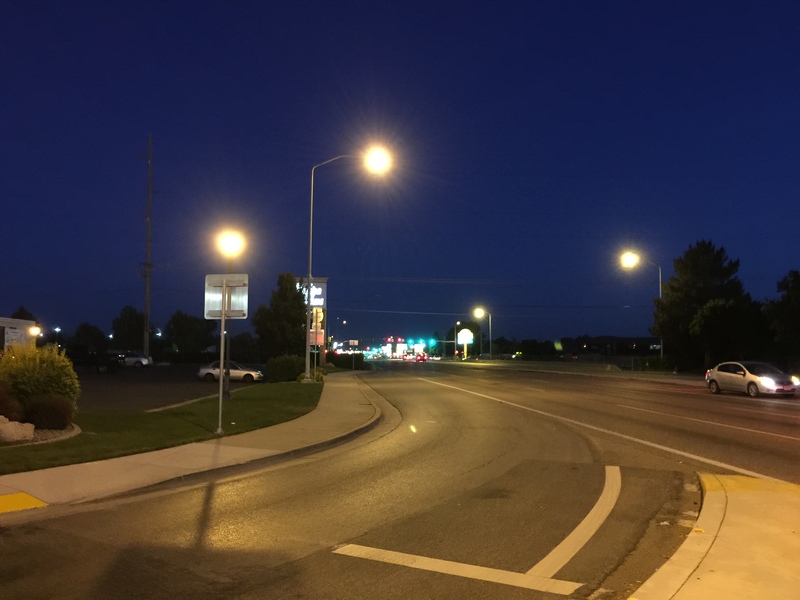 Still, it’s not a long walk to the intersection of Winchester and State, which has a lot of commercial development. As you’d expect for a newer US suburb, it’s auto-oriented development, which makes for a little longer walk to get to the actual stuff. 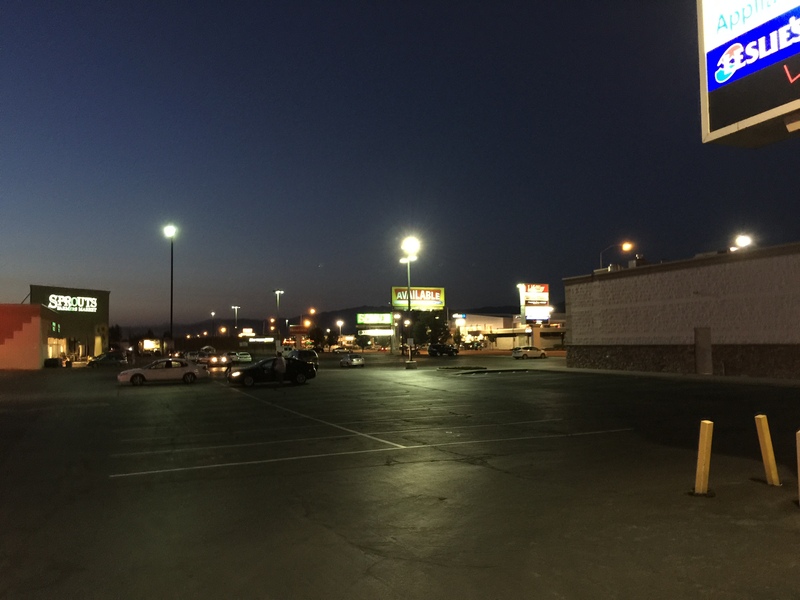 It would have been nice to explore further north on State, including some of the nearby residential neighborhoods, but it was getting late, so I grabbed a drink (and food, because Utah) and then headed back to the station. This is admittedly a difficult area for walkability. The light rail line takes advantage of an existing freight rail corridor, but that means some nearby development is industrial. The 15 and the 215 freeways break up the built environment. There are mixed-use districts and a TOD district in Murray, but at stations further to the north. Most of the land between the Fashion Place West station and State is zoned R-1-8, for single-family houses with minimum 8,000 SF lots. In places like this, a light rail line may almost be acting like a commuter rail line – albeit one with very good frequency! The parking lots around the station will no doubt drive many urbanists crazy, but they’re probably a necessity to make the line practical for a lot of users. The station has a bus loop, which seems like overkill considering the frequencies on the two routes serving it, though it is the end point for both routes. I only had a little other free time while in Utah, and I ended up using it to see Temple Square. The next installment of this series, whenever it is, will take us back to Seoul. This entry was posted in Uncategorized and tagged Salt Lake City, walkabout on November 16, 2015 by letsgola. Lately, I’ve been reading a lot of Granola Shotgun, which has me thinking about a theme that frequently pops up in land use discussions, which I think should be called the “Give Up” Solution to housing costs. There are variations, but the core premise is that the high expense of living in coastal cities is an immutable fact, so many people – especially young people who enjoy urban or streetcar suburban neighborhoods – should give up and move to another city somewhere else. This other city is frequently a smaller former industrial city in the Midwest – Granola Shotgun calls them “an archipelago of West Berlins”. This may be a good option for some people, but for many others it is a bad option or not an option at all, and it is not a solution for our housing issues in coastal cities. To see why, let’s look at who this option works for and what opportunities are provided by smaller cities. More than anything, the Give Up Solution is predicated on having several good options available. There is a particular group of people who have good options for high-paying employment in many parts of the country, yet are nominally poor enough to be inconvenienced by high housing costs: upper class and middle class professionals with skills that are in broad demand, and individuals with specialized skills whose work can be performed remotely from anywhere. The New York Times Real Estate section specializes in dramatizing the housing struggles of this class, again and again running variations on “Upper Class Professional Moves to Place that is Not Quite Brooklyn, Discovers It to Still Be Reasonably Livable”, almost to the point you’d think they’re being placed by the folks at realtor dot com..
Here’s an example from Granola Shotgun about the Over-the-Rhine neighborhood in Cincinnati. Instead of taking a job in San Francisco and paying a lot of money in rent, the subject took a job in Cincinnati, and bought and renovated an old building for far less money. That’s great! We shouldn’t begrudge someone for having multiple opportunities. We should be happy that there is new investment in cities that have seen decades of disinvestment. We should want every city and every region to succeed and improve quality of life for its residents. While this option is available and viable for many people, it’s clearly not a solution for everyone. Some fields are very specialized and exist only in a few places, while some professional jobs, such as teachers, necessarily exist everywhere, though as mentioned, high housing costs are not as much of an issue for many professionals. Every city, though, has many low-income jobs in service industries that cannot be relocated. Higher minimum wages are set to take effect in many California cities, but they are still well short of what would be needed to make these cities affordable. For low-income workers, it is not at all clear they could improve their lot by moving to a place where their wages might be even lower. Many may struggle to even pull together the resources needed to relocate. And in any event, it is pure fantasy to think that enough low wage workers could leave a region the size of LA to drive wages up and housing costs down to the point of affordability. The history of low-wage work would seem to suggest that unionization or government regulation, not labor scarcity, is what secures living wages in the long run. Urban economies depend on thousands of low-wage workers, and housing policy ought to work for those folks too. The problems caused by high housing costs have economic consequences too. The logic is simple: to suggest that there are no negative outcomes from artificially inflated housing costs is to deny that agglomeration effects are real. (By “agglomeration effects”, we really just mean that when you get a bunch of people together, they can accomplish more together than they could individually.) Now, this certainly doesn’t mean that innovation doesn’t happen outside large cities. There are people with all sorts of different talents, from all walks of life, all across the world. But to say there are no negative effects from preventing people from congregating in cities is to deny the entire reason cities exist. This makes intuitive sense, and it is also backed up by a growing body of economic research by the likes of Hsieh and Moretti. Beyond that, cities offer other benefits that are harder to quantify but no less real. For example, groups of immigrants often congregate in a particular neighborhood in their new homeland. The social networks developed among first generation immigrants are often crucial to finding employment, adjusting to new cultural surroundings, and establishing a new life. Another example is the anonymity afforded by large cities. For socially marginalized groups, the anonymity of the city is liberating; likewise, individuals who need a new start in life can reinvent themselves in a city in a way that is not possible in towns, whose intimacy is suffocating, no matter how walkable they are. But even beyond that, you shouldn’t have to justify your desire to live in a city to anyone. Not to me, not to some NIMBY, not to some person in charge of a housing lottery. Scarcity is the basis of exclusion, and while it is terrible to use prices to exclude people, other methods of exclusion are hardly better. If you want to live in LA, that’s good enough for me. I can’t wait to see what you’ll do. This entry was posted in Uncategorized and tagged Affordable housing on November 6, 2015 by letsgola. The cost of housing in Los Angeles is very high by any measure, and we talk about it a lot here. We believe that for LA to be the best city it can be, we have to be welcoming, and part of that means reasonably priced housing. We know that means LA needs a housing boom. We’ve looked at traditional forms of mass-produced privately-funded affordable housing, like the dingbat and the courtyard building, and why they don’t get built anymore. We’ve made passionate calls to focus on increasing the supply of housing of all types, for people of all types. And we’ve argued that housing supply advocates and affordable housing advocates need to work together to overcome the obstacles to building more housing. Now, there’s a new housing advocacy group in LA, working on these very issues: Abundant Housing LA. The goal is simple: to make Los Angeles a place where anyone can find housing at a reasonable cost and pursue their dreams. The task, changing the way we think about housing, is not. AHLA is currently competing for an LA2050 Challenge Grant, and proposes to use the money to conduct community outreach, support new housing across the region, and help engage the vast majority of people who are currently uninvolved in land use decisions. If you believe that LA should be a city that is sustainable, affordable, and welcoming to all, I strongly urge you to vote for Abundant Housing, and help restore the California dream. This entry was posted in Uncategorized and tagged abundant housing on November 1, 2015 by letsgola.